Far-right Right Sector party leader Dmitry Yarosh has called his supporters to mobilize and get ready to take decisive steps to ‘defend Ukraine’s sovereignty’. He urged the security forces not to interfere but help the nationalists restore ‘legal order’. “I call upon the Ukrainian security forces not only to refrain from counteracting the Right Sector, but also help [the party members] to bring legal order to the Ukrainian land,” he said. On Monday radical activists representing the Right Sector attempted to storm Kiev’s Supreme Court building, demanding the adoption of lustration legislation, which implies that people connected to the former regime may not hold office in the new authority. 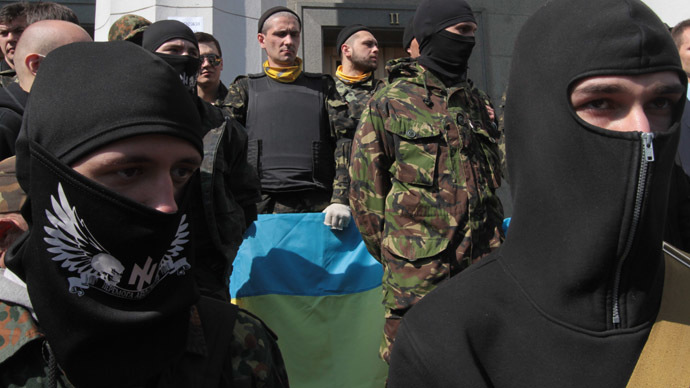 Over 1,500 nationalists from the Right Sector circled the Ukrainian parliament in Kiev on March 27. They demanded the resignation of Ukraine’s Interior Minister Arsen Avakov after the police killed Aleksandr Muzychko also known as Sashko Bilyi, one of the Right Sector leaders. 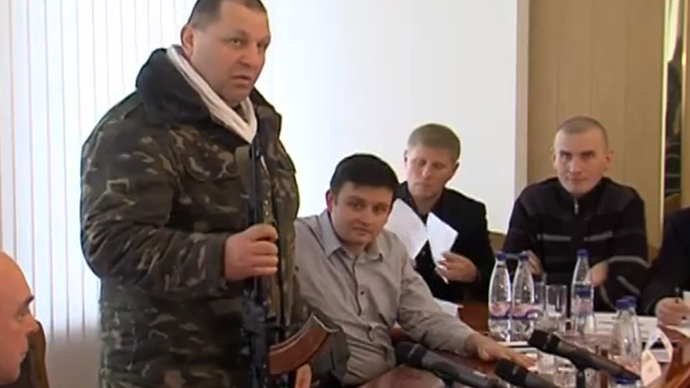 The group held Avakov personally responsible for the death of the notorious radical militant. 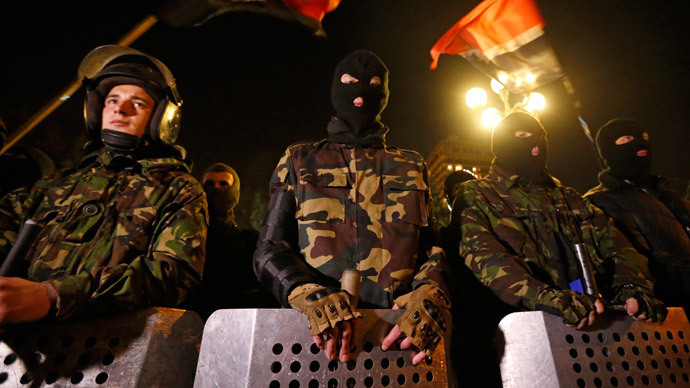 Following the siege of Kiev parliament Ukraine’s security officials discussed banning the Right Sector. The Right Sector movement first came to international spotlight at the end of November 2013 supporting the pro-EU protests in Kiev. Its members were very active in the violence which triggered the ouster of President Viktor Yanukovich. Right Sector fighters used clubs, petrol bombs, and firearms against Ukrainian police while wearing Nazi insignia. In March the ultra-nationalist movement decided to become a political party, nominating Yarosh for president. 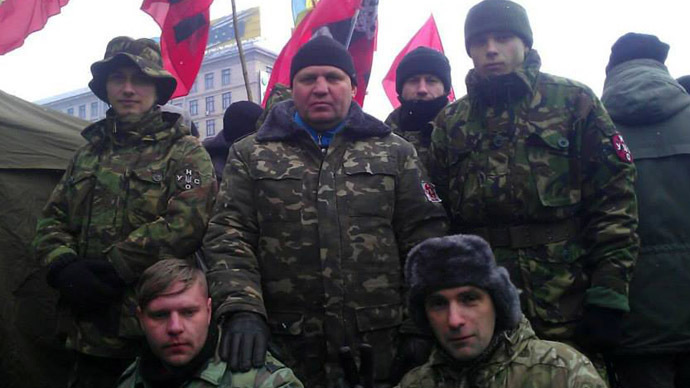 Yarosh has headed an ultra-right Stepan Bandera All-Ukrainian Organization ″Tryzub″ since 2005. 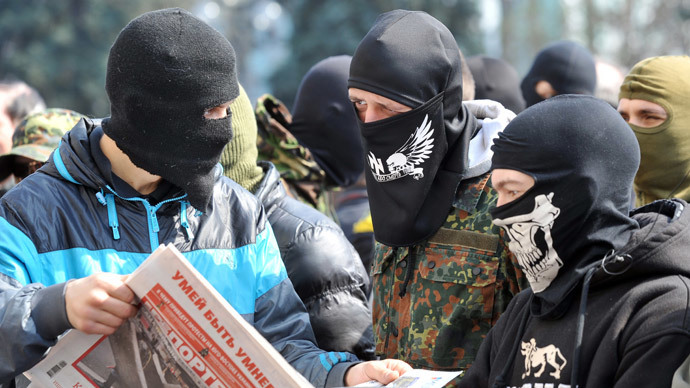 During the EuroMaidan protests, the organization became the base of the Right Sector. Russia put Yarosh on an international wanted list and charged him with inciting terrorism after he urged Chechen terrorist leader Doku Umarov to launch attacks on Russia. Yarosh has also threatened to destroy Russian pipelines on Ukrainian territory.